Cancun, the premiere tourist city in Mexico, is a combination of two areas: the city centre inland, and the resort centre which sports a line of towering hotels flanked by aqua water and white sand beaches. Cancun is full of resort-style fun, the best of which includes visits to the many picturesque beaches and golf courses which are all similarly idyllic. Cancun cruises usually don't actually stop at Cancun but instead farther south at Calica, also called Playa Del Carmen, which is about an hour's drive, located 41 miles (66 kilometers) from the city. Calica can berth two cruise liners and cruises that stop at the city of Cancun anchor far offshore with long tender rides to a small pier. Cruise excursions also arrive from Cozumel. From Calica shuttles can transport visitors to Cancun. From the Cancun Pier or downtown a host of taxies are available although much of the city and resort area is within easy walking distance. A ferry or regular buses are great for longer excursions outside of Cancun. 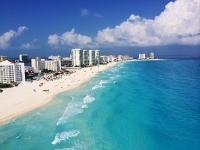 Beaches are the main attraction in Cancun, although no one is particularly nicer than another. On most beaches, you'll be able to partake in every conceivable water activity, from speed boating to scuba diving. The most popular inland attractions are a choice of golf courses although there are also great trips to ancient Mayan ruins such as Tulum and Chichen Itza. Huge shopping complexes are enticing and despite its spring break reputation, the nightlife is lively and appropriate for all ages. With six huge and modern shopping complexes and hundreds of stores shopping can be overwhelming. A popular place for local souvenirs instead of designer fashion is one of three markets, the largest being Market 28 also called mercado veintiocho.